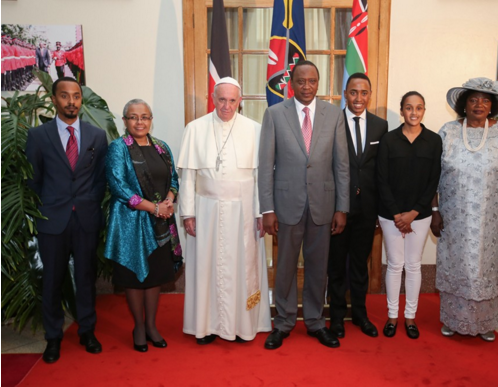 President Kenyatta's daughter Ngina is all over the new after she posed for a family photo with the pope wearing a tight figure hugging white jeans. The family was meeting the pope for a state dinner and Ngina didn't dress well for the occasion which was meant to honor the religious leader. The first daughter seemed to have left in a hurry or didn't care what papa Francis r the delegates he was with would think. The KOT went crazy when Unye posted the photo online. There is nothing wrong with that, it is her era... just like ghere was nothing wrong when our parents wore belly-bottoms and minis. 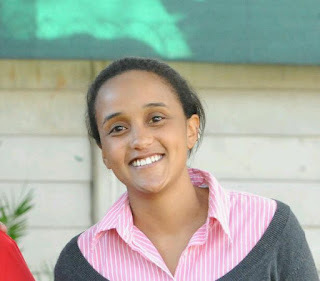 Nairobi Gossip News, I bet some of you are choking with hate toward the beautiful Ngina and the First Family. Shame on you and check yourself! What's this hula balula about? She can what the F*** she wants to wear. This is why women get stripped in Kenya because of judgemental idiots like you. leave the first family alone, Pope never complained, pls shut up!!!!!!!! !